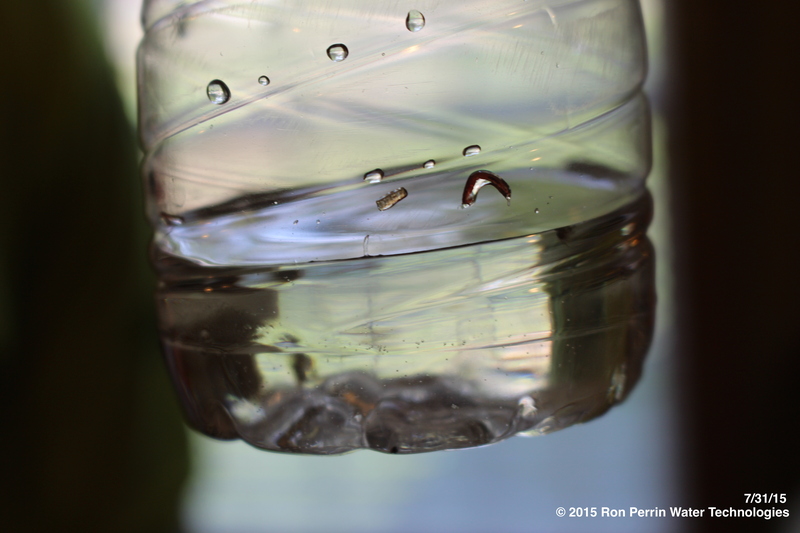 TEXAS July 2015 – WORMS IN TAP WATER! Worms are ok in water if you’re fishing, but Thursday morning, the 30th of July, I woke to see a news story about worms in drinking water. I live in Fort Worth but the story was getting wide coverage from CBS Houston. I had to know more about this! I went to work and told Ryan, our director of media & video production, to pack a bag because we were headed to Houston. We went to the heart of the story, Woodland Acres, which is a subdivision in Old River-Winfree about 25 miles east of Baytown, Texas, to see the worms for ourselves. We met several residents who were still had worms coming out of their tap water. According to Wikipedia, the humble blood worm is the larvae of a midge fly. I had read the privately held utility had told their customers that the worms are coming from their own pipes. The Texas Commission on Environmental Quality (TCEQ) did an inspection of the system on Thursday, July 30th, 2015. From the first report, I saw that TCEQ seemed to think the worms may be related to the fact that the wastewater plant and the freshwater plant are on the same property. While that may be true, the fact is the worms were introduced into the system from a fly about the size of a mosquitoe. If it was at the water plant there is a breach in the clean water tank allowing the flies to get in. While I was personally in the neighborhood speaking to residents, I noticed two water storage tanks were in very close proximity to several dumpsters. The first thing I would do is check the tanks for breaches. The state requires that potable water storage tanks be inspected inside and out every year. Our company has inspected over 6,000 water tanks since starting business in 1997. The most common problem we repeatedly see on tanks is with the vent screen. Texas requires the screen to be # 16 mesh or smaller. Vent screens often corrode away and blow off in storms. If the screen is too large, it could allow the very small midge fly to enter the tank. They should be looking for a corroded spot, missing bolt or any other breach large enough for insects to enter the tank. After inspecting the exterior of the tanks I would want to see the sediment levels. Sediment builds up in most water storage tank one little particle at a time. Over a period of years this can add up to several inches, over enough time the inches can become feet. The sediment can offer a safe habitat for bacteria, protozoa and even viruses to get a foothold in the water storage system to grow and become a bigger problem. If there is sediment on the floor of the tank the worms would be using that as a habitat to grow undetected. This could have gone unnoticed for a long time, but when the system lost power over the weekend, the colony expanded beyond the safety of the sediment. The American Water Works Association recommends that potable water storage tanks be cleaned every three to five years or “As Needed”. At this time the USEPA nor TCEQ has any set rules for when a water storage tank should be cleaned. I would be very curious as to when the last time these tanks were cleaned. Do you think water storage tanks should be cleaned at least once every 5 years? Take my poll at: “The Clean Water Tank Project”. We will be posting more about this on my blog “www.cleanwatertankproject.com“. Midges are collectors and parasites. They usually burrow into the sediment and gather food. Midges come in various colors from clear, to brown, to pink and red. Red midges indicate a highly anaerobic (low oxygen) environment. Often midges appear to be tiny squirming worms. In August of 2013 the small town of Colcord Oklahoma lost their water supply to an outbreak of blood worms in the water system. According to Cody Gibby the towns water commissioner the worms could not be killed with chlorine. January 2001 DELTONA, Miss. — Denise Kodya was filling the tub one night this week to give her kids a bath when she found what she thought was a little fiber of burgundy-colored carpet floating in the water.